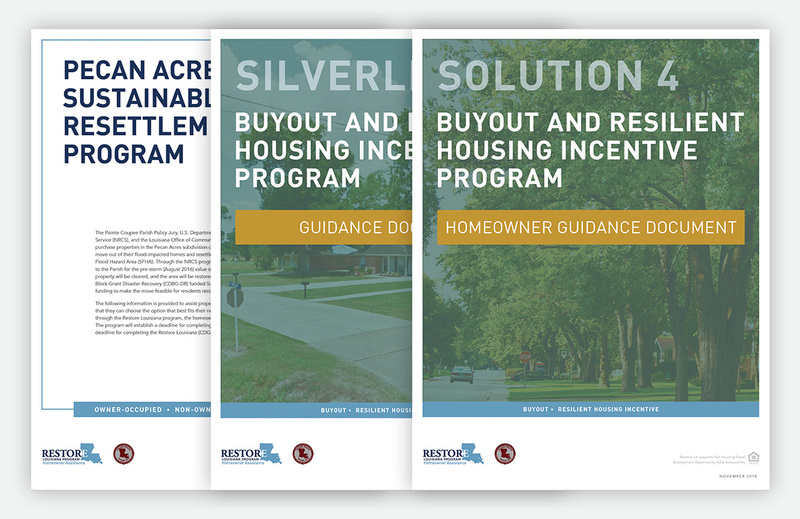 The Louisiana Office of Community Development has launched the Restore Louisiana Buyout and Resilient Housing Incentive Program (Solution 4) with the goal of moving eligible residents out of harm’s way and reducing future flood risk by creating a permanent open space that serves as a buffer against future storms and floods. The program is designed to give residents the flexibility to choose the best option for their individual situation. Solution 4 is a voluntary program and is available for eligible homeowners whose primary residences are located in floodways, and provides assistance to help families move away from high risk areas to lower risk areas. To submit an application for program assistance, please call (866) 735-2001 and choose option 2. Applications will be available starting December 3, 2018 and can be completed over the phone or submitted in person by scheduling an appointment at the Restore Louisiana Office at 11100 Mead Road in Baton Rouge.